My sister & brother-in-law will be thrilled with this special symbol of their lifelong devotion to each other. 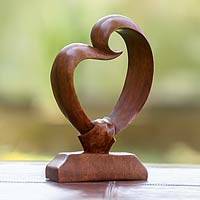 Romantic Wood Sculpture, "Heart Bond"
Totally abstract, graceful arcs come together to form a bond of the heart. 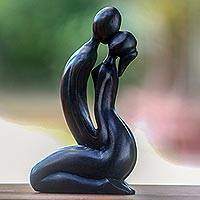 Wayan Rendah renders the appealing image in suar wood, representing affection and deep love. 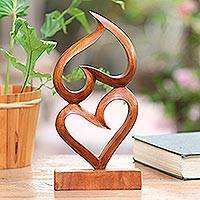 Romantic Wood Sculpture, "Eternity of Love"
Handmade Heart Shaped Wood Sculpture, "Love Blossoms"
"This sculpture expresses love and sharing," says Eka of this exquisite piece. 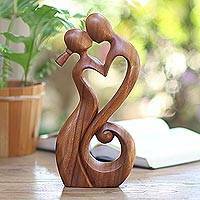 It is carved by hand from suar wood featuring fluid lines that convey the essence of natural harmony. 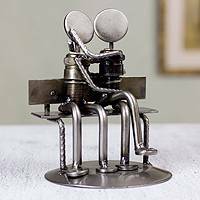 "The essence of life can't be seen without the eyes of the heart.” A sentiment that drives Brazil’s Flory Menezes to create some of the most stunning romantic sculptures you’ll ever see. 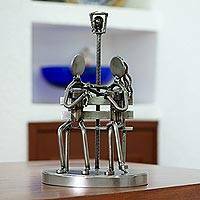 And, Flory, like NOVICA artisans worldwide, pours her heart and soul into every unique exploration of this most basic of all human emotions. 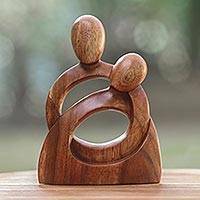 In this collection, you’ll see this sentiment echoed through the hands and hearts of sculptors from the South and Central America to West Africa and Asia. An international collection of romantic art at once varied and singular in its common purpose – the visual expression of love through sculpture. 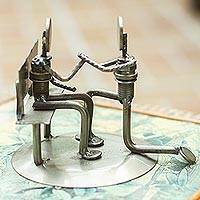 This is truly an international collection of very personal interpretations of love to warm your heart, and your home.